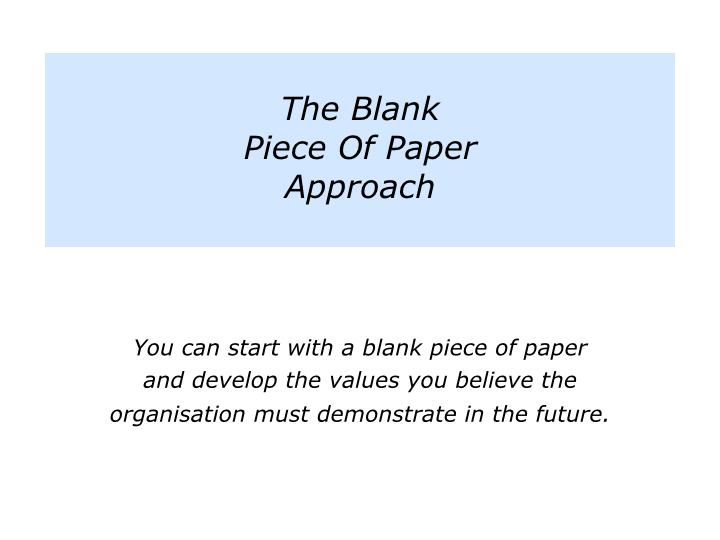 Great organisations live their values, rather than just laminate the values. They follow their credo, even when times get rough. They recognise that a value is not a value until it is lived. Let’s explore how to build such an organisation. Great organisations provide a set of guiding principles that people can refer to every day. 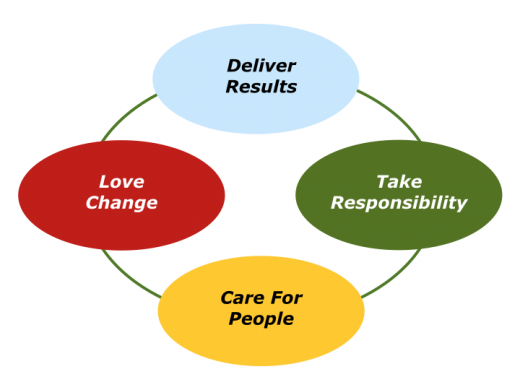 They focus on this common compass when hiring employees, making decisions or running the daily business. There are many benefits to building such an organisation. Here are some of these. Let’s explore the paradox mentioned above. Providing a set of values gives leaders more control and yet also enables people to be self managing. Why? They recruit and promote people who live the values. They agree with people on their best contribution to achieving the organisation’s vision. They then manage by outcomes, rather than by tasks. People are encouraged to be self managing within the overall guidelines and given support to deliver the goods. The leader focuses on what the person delivers – fulfilling their agreed contribution to the vision – and how they deliver it in terms of following the organisation’s values. 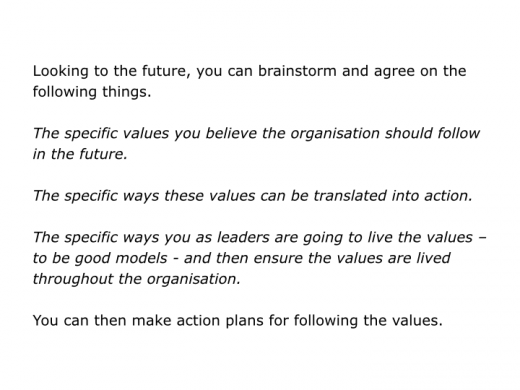 Imagine you want to clarify a set of values for your organisation. There are several ways it is possible to make this happen. Each route has both pluses and minuses. One point is worth underlining. The leaders need to take charge of developing and then living the values. They are accountable for running the organisation. Employees will watch what these people do, rather than what they say. The leaders must therefore believe in the values and see these as the basis for shaping the future. This does not mean that the leaders go into a bunker and emerge to email the values to everybody else. And it certainly does not mean they hire a marketing company to come up with the values. The leaders need to craft the values in an organic way. The values must build on the organisation’s strengths and successful style, yet also provides the basis for shaping a successful future. The leaders also need to, at an appropriate time, involve a wider group of people in shaping the values. This must be done properly, however, to give people a sense of ownership within certain parameters. So imagine you are crafting your organisation’s values. Here are three options for taking these steps. There are, of course, other approaches you can take to clarifying the values. Let’s assume that you have agreed on a general set of values. How can you word them in a compelling way? By living them every day. By publicising success stories that show how people are living the values. Many companies have produced values statements that try to cover every eventuality. These sometimes end up as long tracts full of good intentions and complicated sentences. You may or may not agree with these values. But people who worked there during that time believed the company lived and rewarded these values. The following points have been found to work regarding the wording. 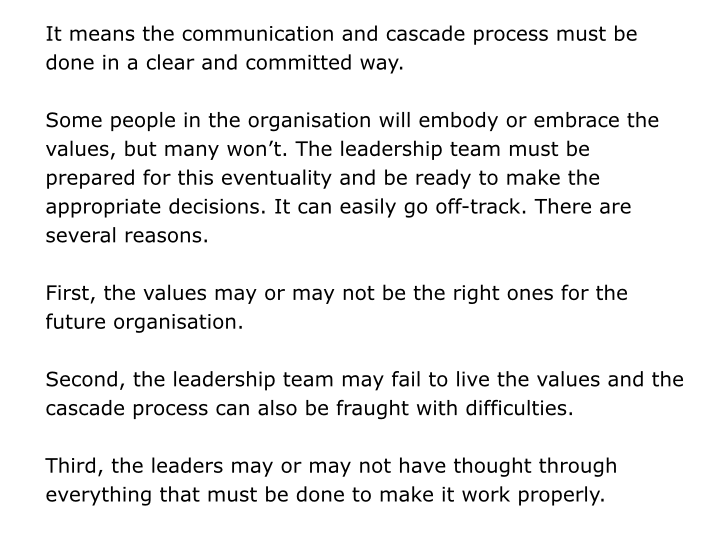 There are obviously many ways to communicate the values to people in an organisation. Virtually all the successful approaches include involving people in fleshing out the values. This can be, for example, by involving people in Values In Action workshops. Here is an overview of what can be covered during such sessions. “This sounds fine,” somebody may say, “but how do you maintain the momentum? They continue to show how the values feed into the organisation’s vision and produce visible results. 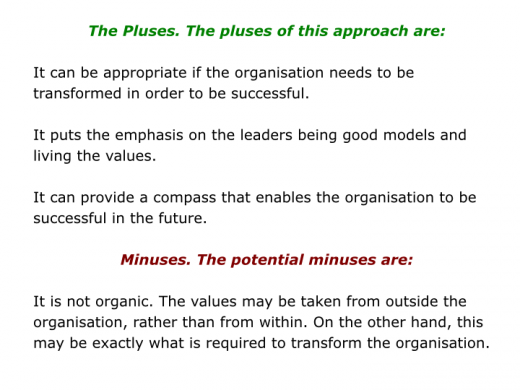 They show how the values form the basis for making key decisions regarding the organisation. They publicise success stories that show how people live the values. They make things physical by embodying the values in the physical changes they make to the building and in other physical changes. They aim to act as positive models by living the values in their own behaviour as leaders. They reward the behaviour they want repeated by highlighting the work of people and teams who translate the values into action. They recruit, reward and promote people who embody the values. They ensure the values are embodied in every aspect of the organisation. These include the organisation’s interviewing process, induction, advertising, website, management style, performance management, promotion, customer service, quality, environmental programme and other areas. They never walk past a quality problem and instantly tackle any form of behaviour that goes against the values. They continue to do whatever is required to build a values driven organisation. Sounds tough? 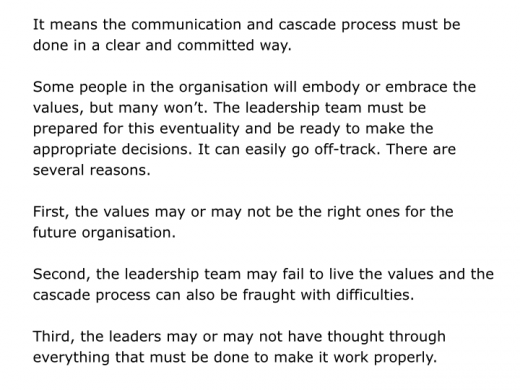 Maybe, but it can be even harder to lead an organisation where people’s values are not aligned. 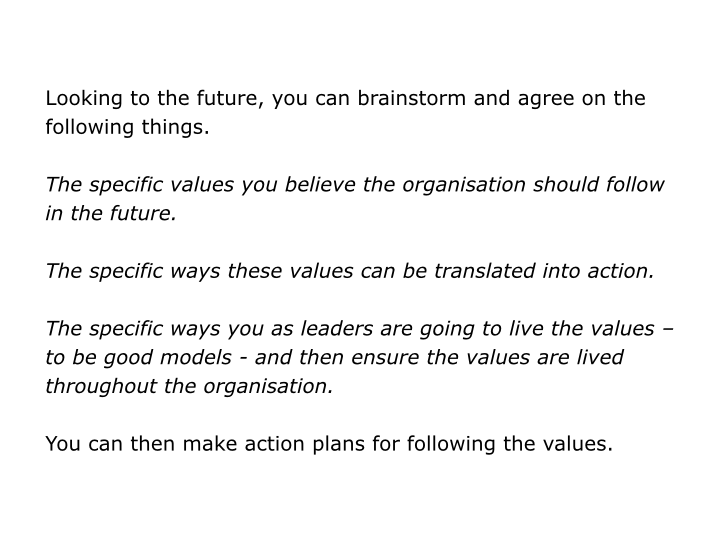 Great organisations follow their values, translate these into a clear vision and deliver visible results. They provide a structure within which people can build on their strengths, perform superb work and achieve ongoing success.